This was my best freezer cooking session to date. 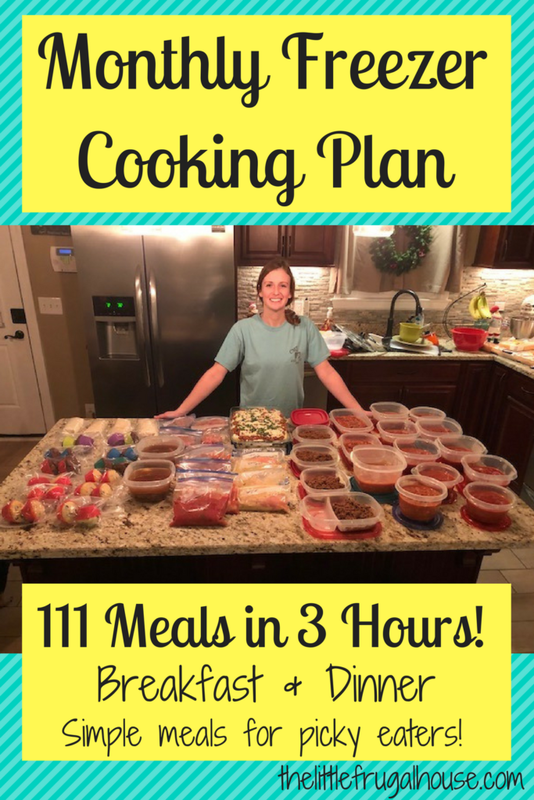 I made 80 meals in 2 hours! You should have seen me (but I’m so glad you didn’t). I threw on an old tshirt, got all my ingredients out, put on some fun music, and I went to town cooking! Like a crazy cooking woman! I was making spaghetti and chili on the stove, and putting together chicken marinade and chicken crock pot meals on the island. I was cutting, dicing, stirring, simmering, chopping, and mixing. It was so much fun for me (yeah, it really was!) and I felt like a cooking boss afterward. I actually think I told my husband that! Is this a weird thing to be proud of? How quickly I can make so many meals? Probably… but call me weird, because I was SO proud when I was done. I just stared at my stack of containers and freezer bags and smiled. The freezer is stocked! And this wife is happy!! Freezer cooking seriously makes my life a million times easier. I can just pull something out of the freezer the night before to thaw in the fridge, and either heat it up or finish cooking it when dinnertime comes around. Or even better – dump it in the crockpot and just wait. We have 40, 2 serving meals of delicious food ready to go for busy nights and nights when I don’t feel like cooking a full meal. And almost all of the ingredients came from Aldi. I’m a dummy and I forgot to keep my receipt. Otherwise, I would also be bragging about how little it cost me to make 80 meals. I know my Aldi grocery trip was about $30 and I bought my meat from Zaycon so it was a very frugal freezer cooking session. Want to be a freezer cooking boss, too? 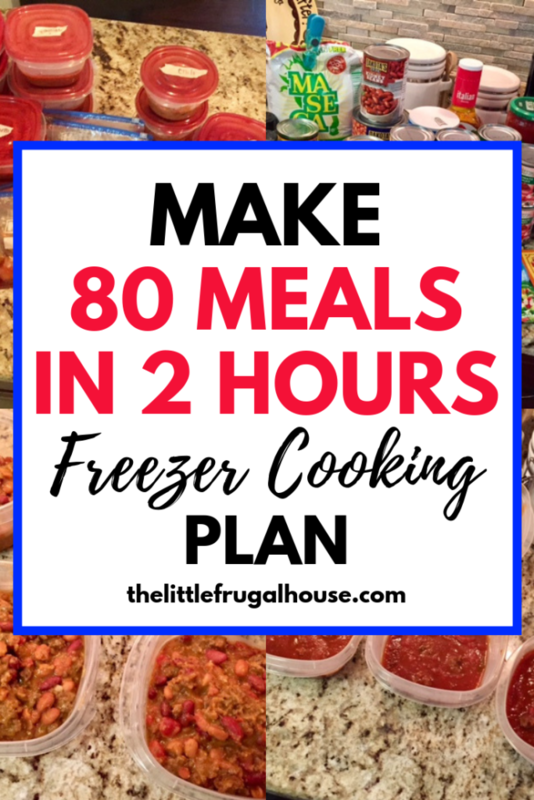 This plan is kind of a mash up of the Chicken Freezer Cooking Plan and the Beef Freezer Cooking Plan with a few more meals mixed in. I made everything into 2 person servings for us, but you can make more or less, depending on your family size. Note: Make sure to sign up with Ibotta, a free cash back app, to get cash back when you go grocery shopping! And you get a $10 welcome bonus! Sign up here! 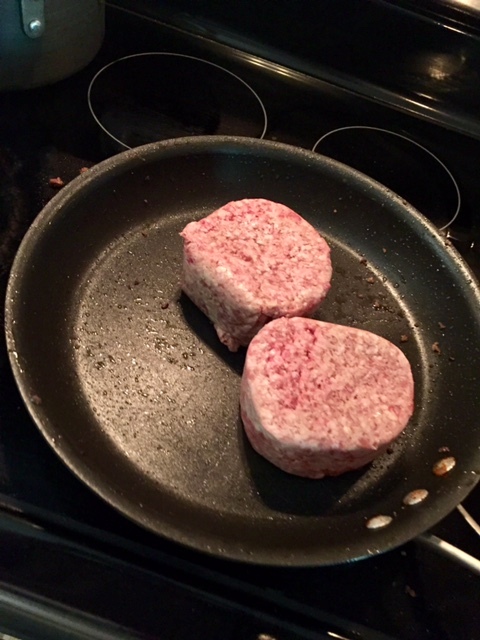 Start browning 4 lbs ground beef in large skillet. 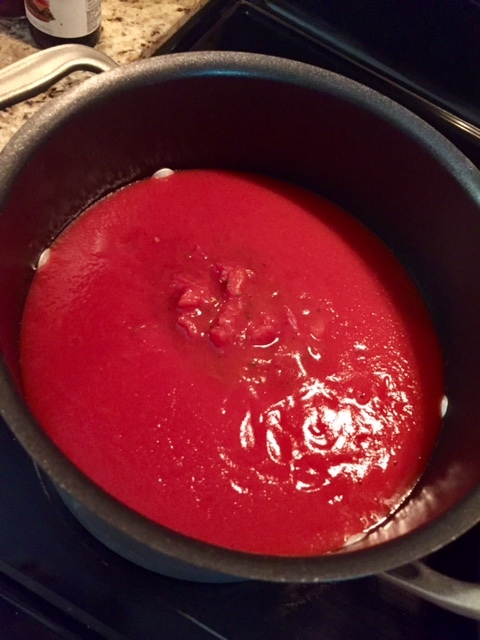 Pour 14 cans of tomato sauce and 2 cans diced tomatoes into large pot to start the spaghetti sauce. Add a dash of hot sauce and worchestire sauce (I don’t measure much, but I would say 2 tbsp. or so of each.) Add desired spaghetti spices. I use about 2 tbsp. of chili powder. I use about 1 tbsp. of garlic powder, onion powder, basil leaves, dried oregano, and about 1 tsp. of cayenne pepper. Mix and let simmer. While beef is browning and spaghetti sauce is simmering, you can start the chicken meals. You will have to go back and forth from your chicken meals to check on ground beef and sauce, but I wanted to list all of the chicken meals together. 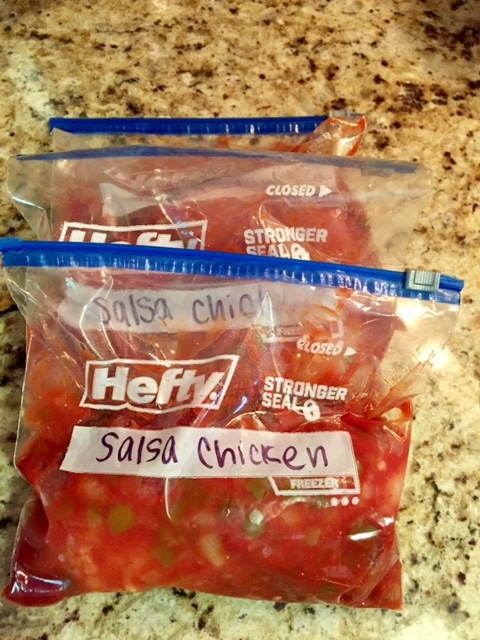 Salsa Chicken – Place 2 small or 1 large chicken breast in freezer bag with 1/3 jar of salsa. Seal bag and label. 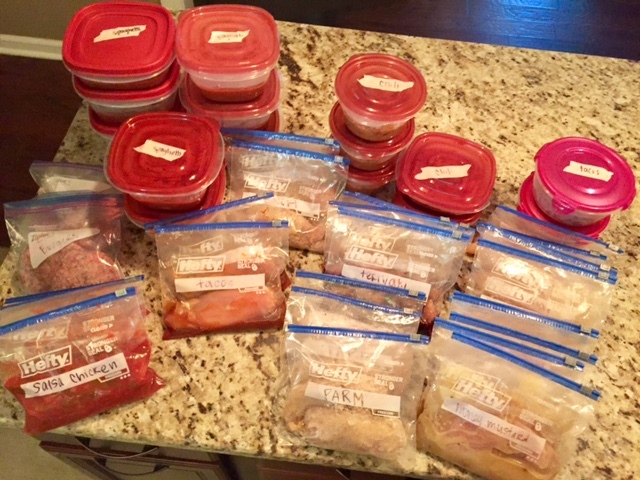 For the two of us, we just eat 1 large chicken breast, so I made 3 bags. 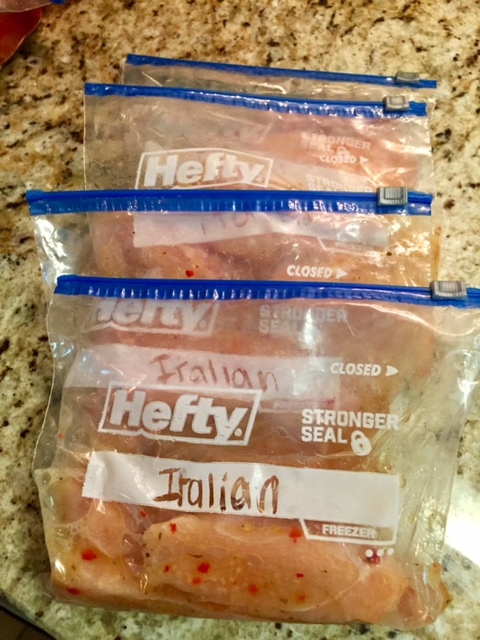 Italian Chicken – Cut 4 large or 8 small chicken breasts into tender pieces, place in freezer bag with 1/4 bottle of Italian dressing. Makes 4 bags. Honey Mustard Chicken – to make The Pioneer Woman’s Ranch Style Chicken – mix 1 cup Dijon mustard, 1 cup honey, juice of 1 lemon, 1 tsp of paprika, 1 tsp of salt, and a sprinkle of crushed red pepper flakes in bowl. 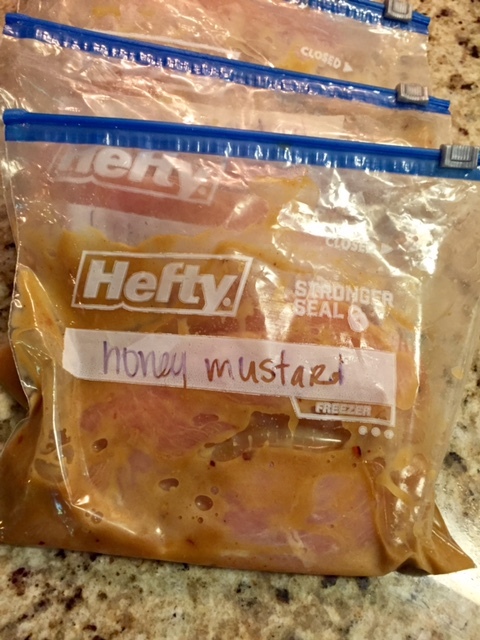 Slice 5 large chicken breasts in half lengthwise (create thinner pieces), place 2 pieces in freezer bag with 1/5 honey mustard mix. Makes 5 bags. Chicken Teriyaki – Mix 2/3 cup soy sauce, 1/2 cup brown sugar, 2 tbsp. sesame seeds, dash of salt and pepper, and 2 diced green onions. 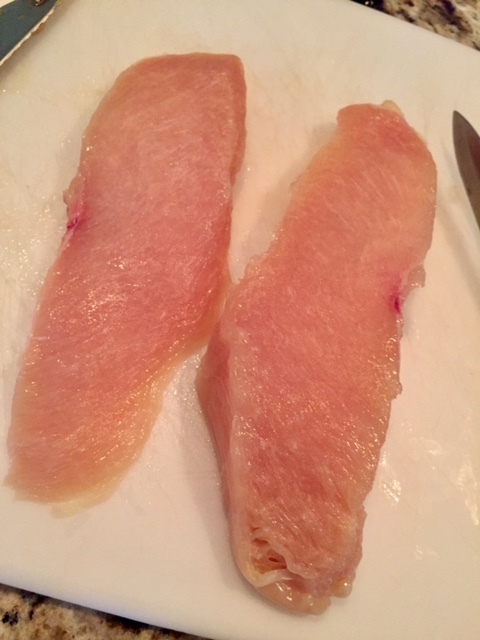 Cut 4 large chicken breast (or 2 small) into bite sized pieces. 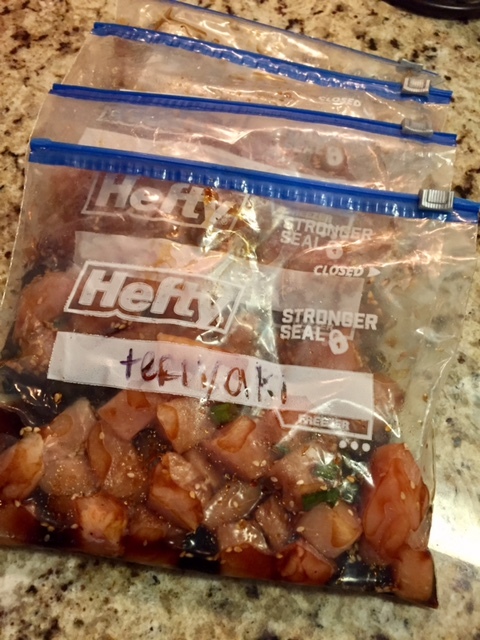 Divide chicken pieces into 4 freezer bags, divide soy sauce mix between bags, seal and label. Makes 4 bags. 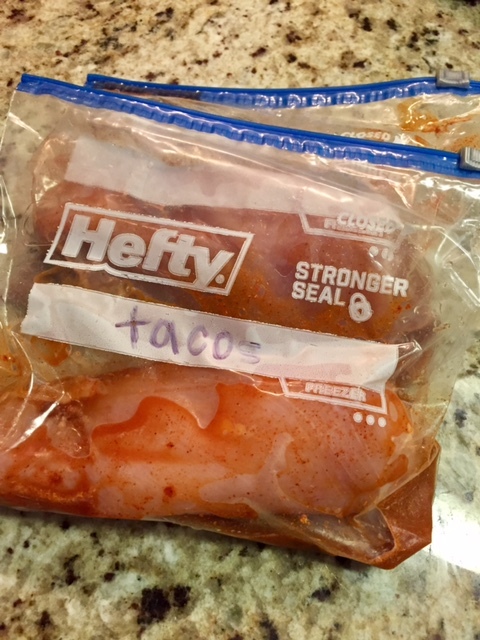 Chicken Tacos – Place 2 large chicken breast (or 4 small) into 2 freezer bags. Mix 1 packet of taco seasoning with 2/3 cup of water and divide between 2 bags. Makes 2 bags. Parmesan Chicken – Whisk 4 eggs with a tsp of water in bowl. 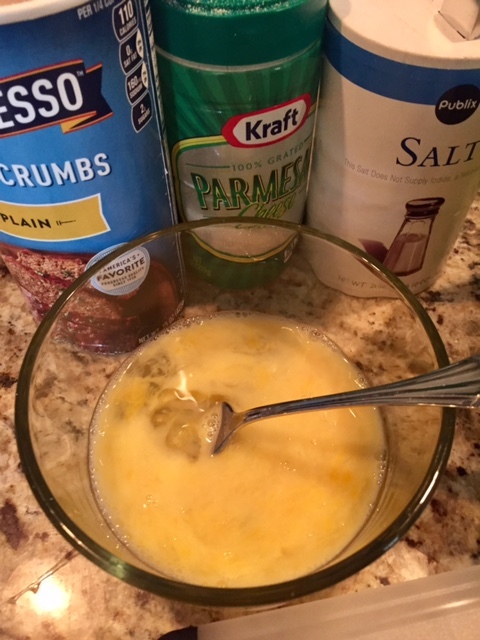 Mix 1/2 cup breadcrumbs, 1/4 cup grated parmesan cheese, 1/4 cup flour, salt, and pepper in another bowl. Cut 3 large chicken breasts in half lengthwise to create 6 thinner chicken breasts. Dip chicken in egg mixture, then breadcrumb mixture. 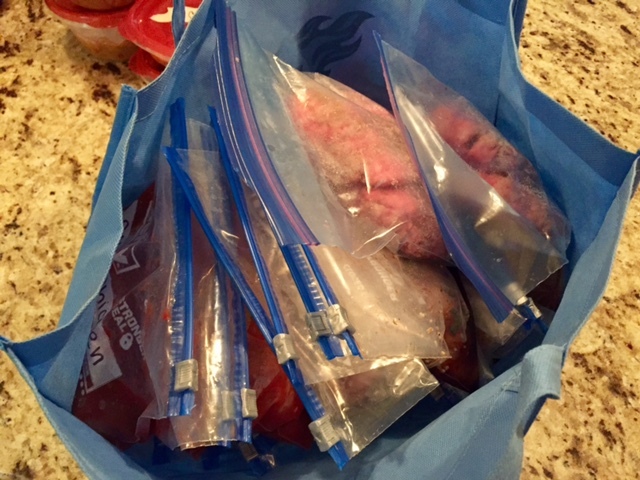 Place 2 pieces in a freezer bag, seal, and label. Makes 3 bags. Ranch Chicken – Cut 2 large chicken breasts in half lengthwise to create 4 smaller breasts. 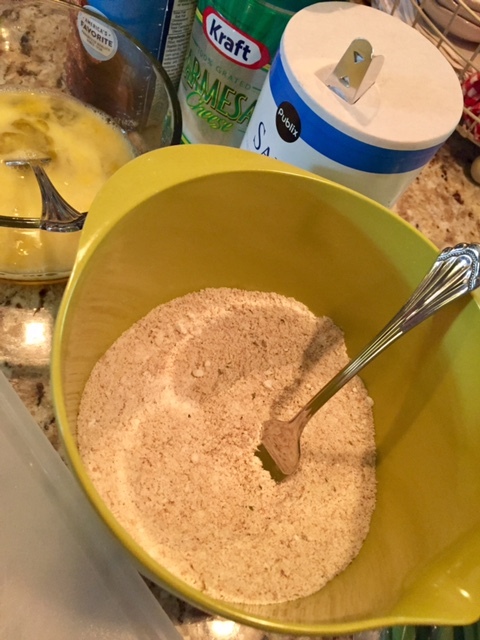 Mix 1/3 cup breadcrumbs, ranch seasoning packet, and 1/4 cup flour together. Dip chicken pieces in egg mixture left from parmesan chicken, and then in breadcrumb mixture. Place 2 pieces in bag, seal, and label. Makes 2 bags. 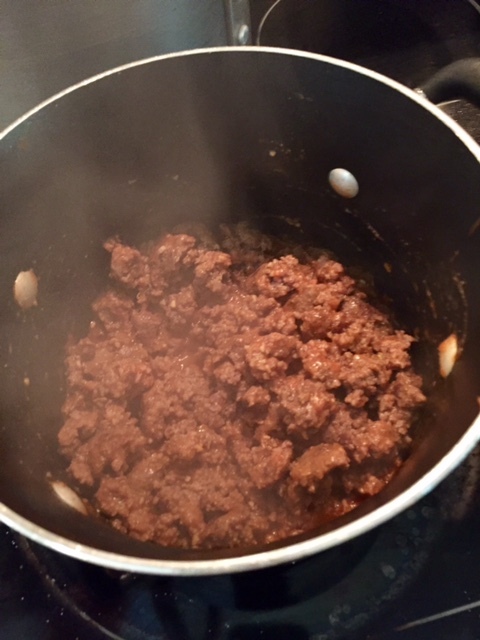 When beef is browned, drain grease, and add half (about 2 lbs) to the spaghetti sauce and stir. Add the other half of the browned beef to your next largest pot. 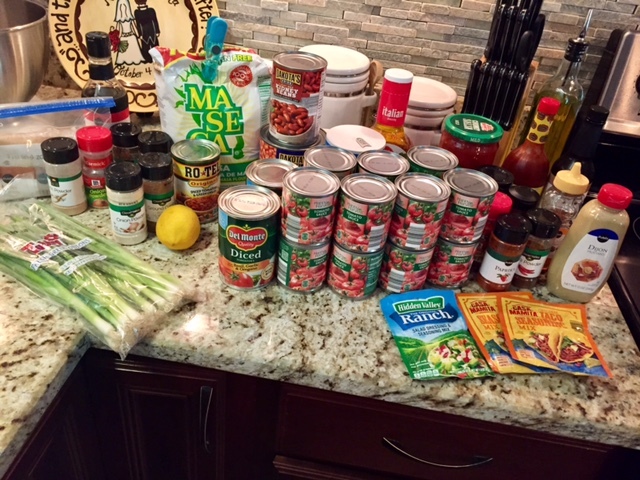 This will be for the chili. I use this recipe from Pioneer Woman. Add the remaining can of tomato sauce and spices: 2 tbsp. of chili powder, 1 tsp ground cumin, 1 tsp ground oregano, 1 tsp salt, 1/4 tsp cayenne pepper. Mix and let simmer (recipe says 1 hr, but I have done more and less.) while you finish the chicken meals. To finish the chili, mix 1/4 cup masa with 1/2 cup water and add to beef. Add the kidney beans, pinto beans, and rotel. Let simmer until ready to divide into containers. Brown 2 more lbs of ground beef for the beef tacos. When the beef is brown, drain the grease, and add the other taco seasoning packet mixed with 2/3 cup water. Simmer and divide into 2 containers when done. 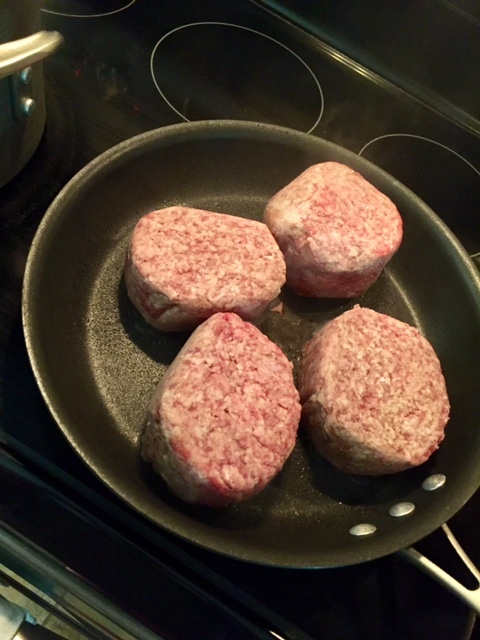 Pat out your burgers using the remaining 2 lbs of ground beef when you get done with the chicken meals. I use Lawry’s seasoning salt and McCormick’s GrillMates Montreal Steak Seasoning. I made 4 burgers and put 2 in a bag. 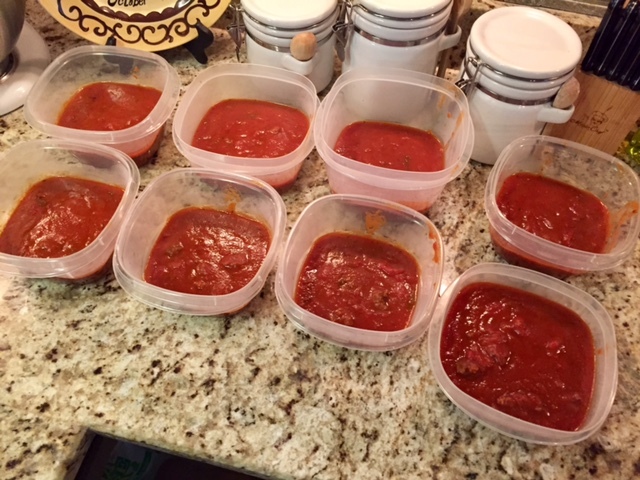 Once all the chicken meals and burgers are made, you can divide your spaghetti sauce and chili into containers. Again we use 2 serving containers, so I had 8 containers of spaghetti and 5 containers of chili. 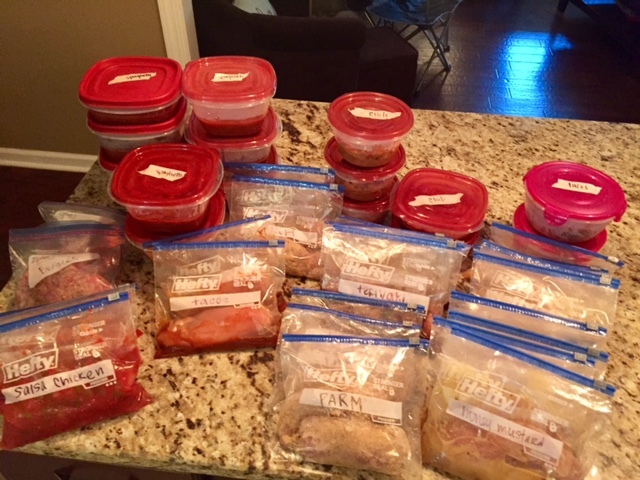 Make sure everything is labeled and freeze. Spaghetti – Thaw sauce in fridge overnight, heat in small pot, boil noodles. Serve with side salad and French bread. 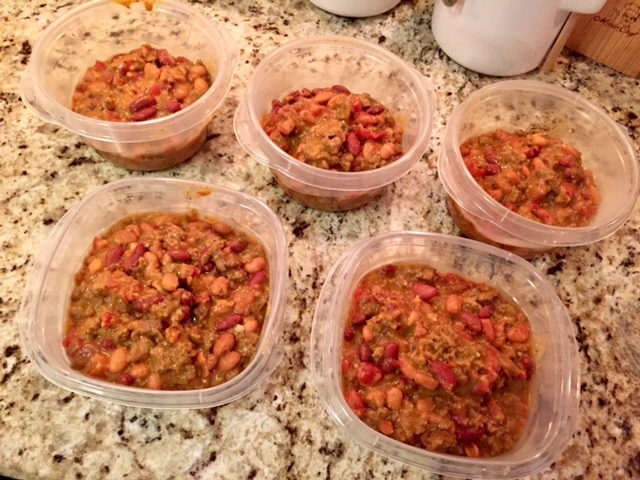 Chili – Thaw in fridge overnight, heat in small pot (or microwave if you’re in a super hurry). Serve with cornbread or Fritos and shredded cheese. 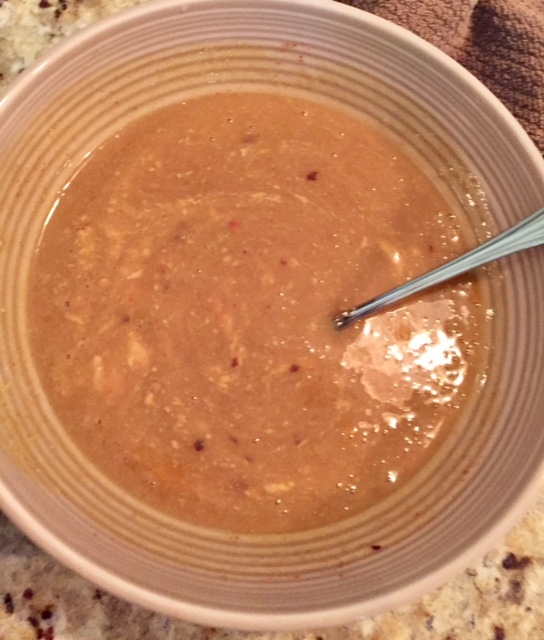 Salsa Chicken – Thaw in fridge overnight, place in small crockpot in the morning on low. Serve with tortillas, shredded cheese, and pico de gallo. 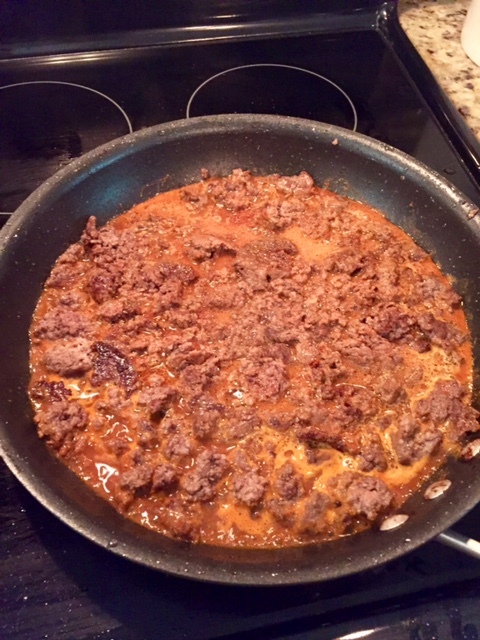 Beef Tacos – Thaw in fridge overnight, heat in skillet or microwave. Serve with flour or corn tortillas, shredded lettuce, pico de gallo, and shredded cheese. Chicken Tacos – Thaw in fridge overnight, place in small crockpot in the morning on low. Serve with flour or corn tortillas, shredded lettuce, pico de gallo, shredded cheese, and sour cream. Italian Chicken – Thaw in fridge overnight, grill in skillet with small amount of oil until a glazed brown color. Serve with a side salad and fresh veggies. 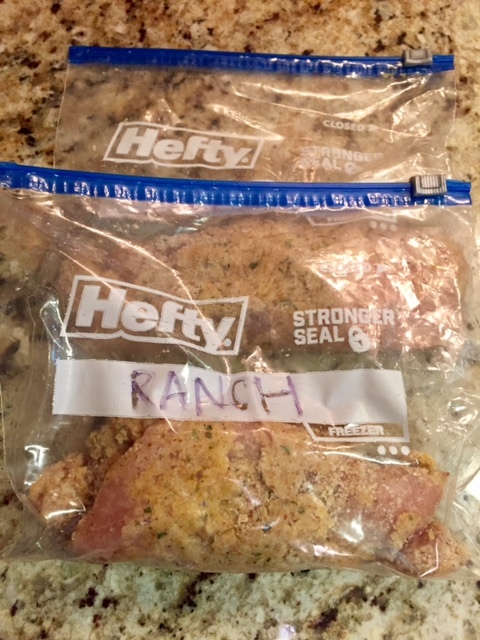 Honey Mustard Chicken – The Pioneer Woman’s Ranch Style Chicken – Thaw in fridge overnight. Heat oven to 400. Fry 2 pieces of bacon, set aside, keep small amount of bacon grease in skillet, grill chicken until glazed brown color. Place chicken pieces on baking sheet, topped with shredded cheese and bacon. Cook for 5-10 minutes, or until cheese is melted. Serve with roasted potatoes and green beans. Chicken Teriyaki – Thaw in fridge overnight, place in skillet with small amount of oil. Serve with white rice and steamed broccoli. 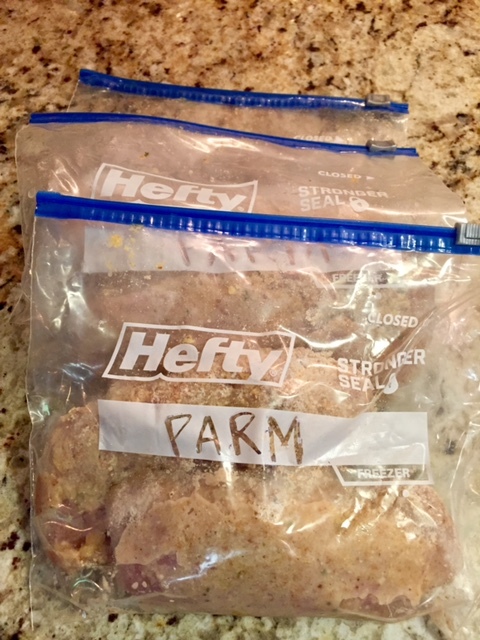 Chicken Parmesan – Thaw in fridge overnight, cook in skillet with small amount of oil. Heat oven to 400 and place chicken on baking sheet when done with a slice of provolone cheese to melt. Serve with angel hair pasta and red sauce. Ranch Chicken – Thaw in fridge overnight, cook in skillet with a small amount of oil. Serve with fresh veggies and a side salad. 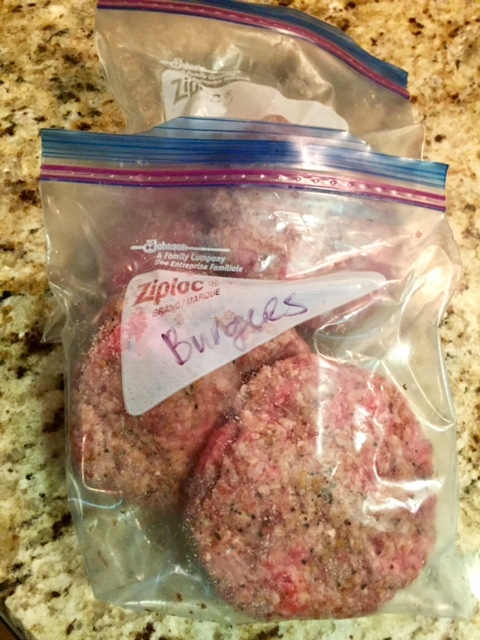 Burgers – Thaw in fridge overnight and grill when ready. I love using potato buns! It sounds exhausting and it kind of is, but you will seriously feel like a boss after you make all this. I might just order a pizza or something super simple for dinner so you don’t have to cook anything else (unless you go ahead and use one of these meals). 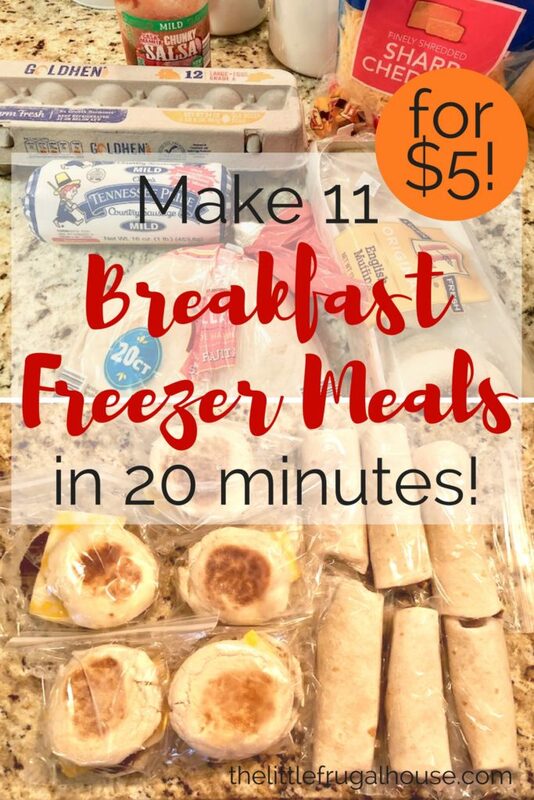 Get the freezer cooking bundle for just $1 here to plan your menu, keep up with favorite meals, and keep track of your freezer meals. 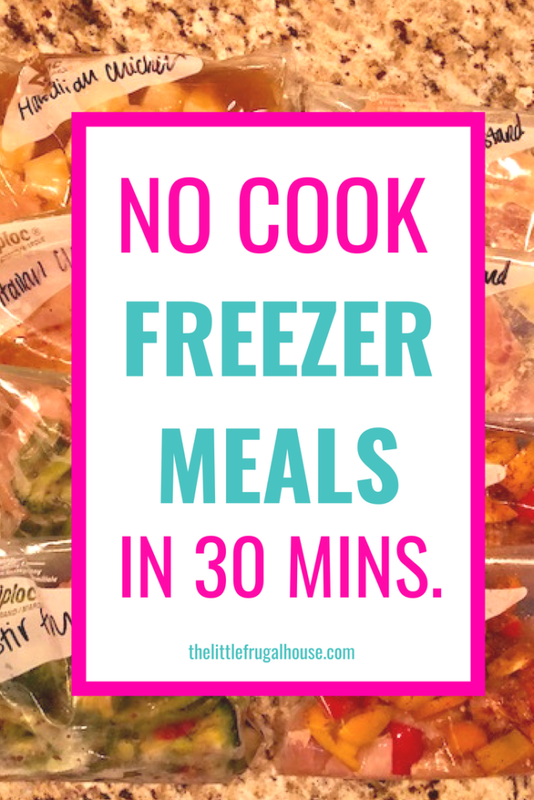 Your freezer is going to be packed and you will be ready for those crazy busy nights where you have to rush to get dinner on the table. And if you don’t have enough freezer space, I would recommend getting a small chest freezer like this one. 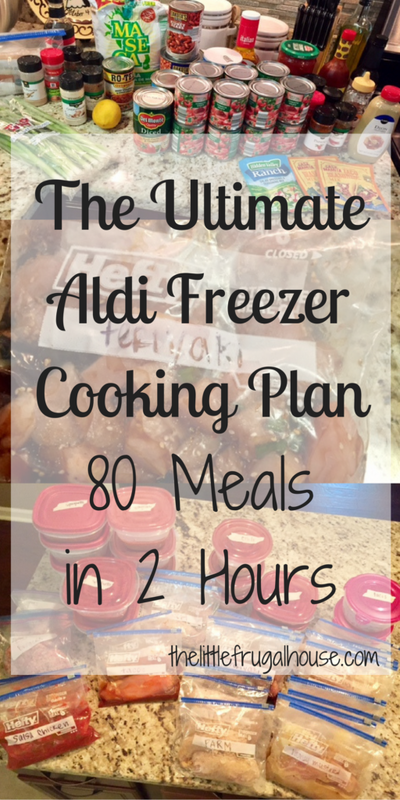 It’s worth the cost to have freezer meals made and ready to go! But no worry, just thaw a meal in the fridge overnight, and add it to the crockpot in the morning, heat it up at dinnertime, or finish the last couple steps to prepare the meal. Either way, it’s so much easier cooking all this at once, rather than making a meal from scratch every night. 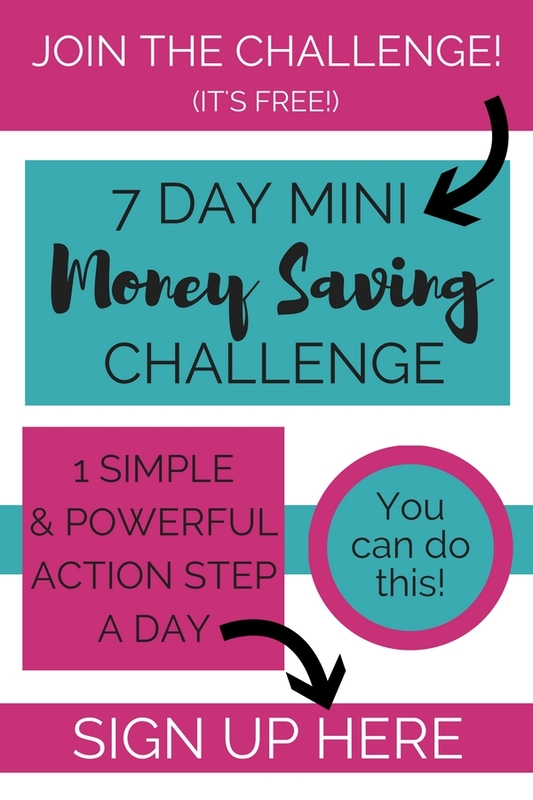 You’re family will be eating good, homemade meals and you will be saving time, money, and your sanity. Win win! Add these meals to your weekly menu and relax knowing most of the work (and dishes) are already done for you. P.S. Want to learn more about freezer cooking? I created a whole freezer cooking binder because I love it so much. 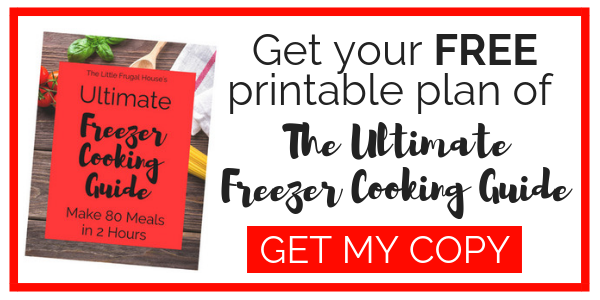 Create More Time with Freezer Cooking has everything you need to learn how to freezer cook step by step. Check it out here! Did IBotta used to have Aldi because I cannot find it in the Ap.? They don’t currently – I wish they did! But if you shop anywhere else, make sure to check those stores for cash back! I think Aldi has the best deals with no fuss of coupons, but Ibotta deals would be great! Hi, do you have any freezer receips for pork? Thank you I love this idea. Thank you for this. What a great resource! I’m just curious if you have any trouble with freezer burn? How long can you keep these in the freezer before it burns? We usually eat everything within about 3 months. Just make sure you have air tight containers and get the air out of ziploc bags. Yes, right under the Instructions heading there is a link to print this plan. Thanks! I found another site to get bulk meat. freshdirect.com. You can choose what size you want and if you want it tied or not. It’s a better option than having to buy a large section of cow and pig then getting it all at once if you don’t have that kind of cash or freezer space. Thank you for this. I loved Aldi when we lived elsewhere, but now the nearest is 1000 miles away. I’m sad!